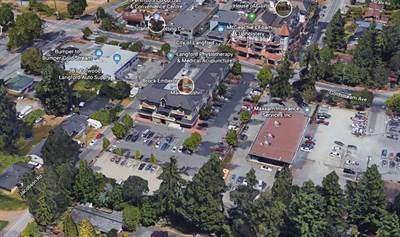 Turn Key Office in Langford City Hall Locate your business in the prestigious “Langford City Hall” building. Very well laid out Professional office includes 17 x 12 conference room, 3 separate offices, reception area, lunch area, copy room and storage room.Plus a south facing Balcony Located on top floor facing South East. Two assigned underground parking and off street customer parking. Excellent Investment opportunity, should lease plus or minus $20 sqft. triple net, Office can be purchased fully furnished.